week 20, how did that happen already? kids are getting out of school for the summer soon, what is everyone doing with your breaks? this was a week of firsts, first week of Denton being away at school, funny how fast your brain forgets that he was just deployed for 15 months, these two weeks were LONG. first time that i did a juice fast, i am currently still working on this, mostly juicing two meals a day and eating something nice and healthy for dinner. more on that in my running blog. first for james riding the ponies at the zoo. look at that crazy happy smile. melts my heart. much of this layout is see through from the other side. the cards are the backs of our disney passes, big d wrote our names on the back. of course, the back of the week title card was also on a clear disney sheet, so you can see that as well. on this side, i used a little flag to write "compost," i compost the pulp from my juice making. 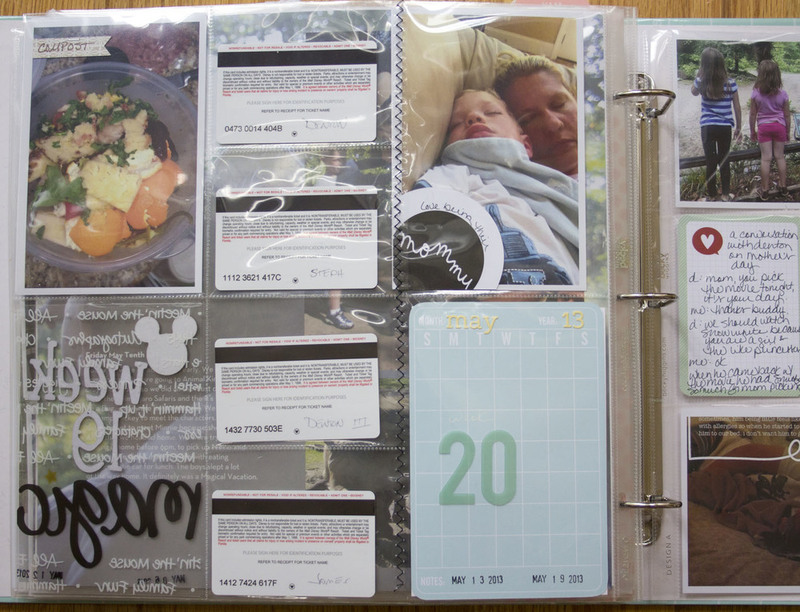 i used the "mommy" card from studio calico's april project life kit. i wrote around the outside of the circle with an american craft precision pen, then used a circle cutter to cut it down to size. i used the calendar card from the may project life kit. i stamped the date on it, then used basic grey stickers for the may' 13 and clear mint colored letters from heidi swapp. on this side of the layout, i used a sticker from studio calico that says "forever friends," and basic grey stickers again to create "super sleepover." i used an ali edwards' digital brush for the "love this." in photoshop, i then wrote a little journaling inside the brush. the little heart in the speech bubble card and the star card came for the studio calico april project life kit. i am really enjoying all the kits, so fun to work with. lastly, the lucky card that i cut down, i believe was from the studio calico grab bag that i purchased when they were available. hope you have a great week, with this i am caught up. week 21 will be uploaded this week.